When it comes to finding out if rehabilitation of oiled birds is a viable mitigation method, there is need for new knowledge. In connection with the responses that have been conducted in Norway during the last 5 years, e.g. after the Rocknes-accident, there was a focus on various research topics related to this oil-seabird issues. One of the topics that need more knowledge and research, is the extent to which seabirds survive after rehabilitation and release. Relatively little research exists internationally, and no research national. The Rocknes response gave us the opportunity to obtain new knowledge within this field. 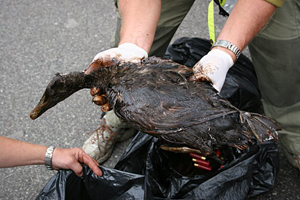 The oil from Rocknes caused damage in the groups of sea- and waterbirds in the coastal waters near Bergen, and largely eiders and various gull species, but also a species like mallards that are common in the marine environment in winter. For one of the gull species, mew gull, Larus canus, we manage to catch enough oiled individuals for a survival study. To strengthen the research project, a control group consisting of the same number of undamaged mew gulls with the same age structure, was caught and ringed. 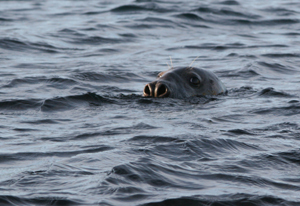 All individuals were tagged and released in their wintering areas in central Bergen. The result is clearly promising, because we found that the same number of oiled gulls and gulls from the control group were recorded in autumn and winter (2005), i.e. the first year after the oil accident. The details of this project can be read in Håland & Mjøs (2006 - in the NNI-Report 160 - attached). The report also referers to other studies on survival of oiled birds, however our discussion is not exhaustive. Sea Mammals are frequently effected by oil spills. Eider duck - oiled and shot.